Running provides countless benefits for those logging the miles. But it also has the potential to do a lot of good for others. 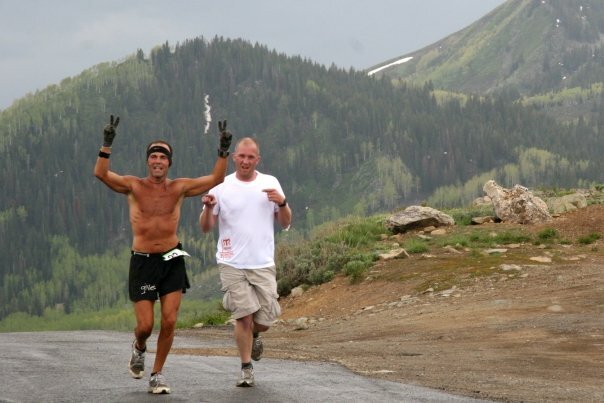 Thomas Budde, founder of the GIVE Shirt, uses running and racing to help inspire others to become healthier and happier. And through his nonprofit organization, he raises money to spread the goodwill even further. 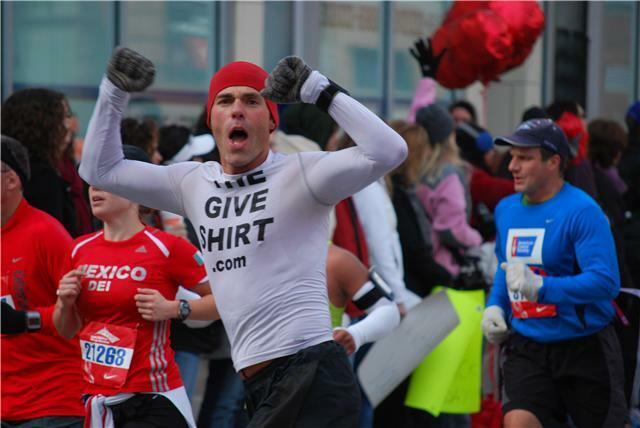 Read on to learn more about the GIVE Shirt and Budde’s own running! Age: 140. Not yet! Still only 41. Years running: 41. But much more often the past 8 years. Pre-race routine: Drink as much purified water with natural electrolytes from glass containers as possible for days, and eat as much organic vegan natural raw food as possible for at least a day. A Facebook “note” entitled “A Tale of Two Six, pt. 2” tells the story excellently. In short, I finally registered for a sprint triathlon to help myself become healthier (exercise, nutrition, etc.). I found myself running the Chicago Marathon a few months later after only having run 11 miles once. I suffered incredibly, learned more than I imagined possible, and helped many others by having and sharing the experience. So many reasons … I’m healthier and younger and feel better physically, emotionally, mentally, spiritually, creatively, etc. I love to help motivate and inspire others to also become healthier and happier. I run to help others – by directly inspiring and motivating them to be healthier and happier, as well as by increasing my vitality and lifespan in order to help others more, and for more years to come. Jogging, hills, steps before and after sessions with clients. Wide variety of workouts with numerous clients, from intense cardio and strength cross-training to walking. Jogging to and from places instead of driving. Taking young nieces and nephew for runs and actively playing with them (chasing around house and yard, pushups with them on my back, helping them do pull-ups). Occasional jogs with friends or groups. Rare jogs from house alone. Ideally a longer run of 20-40 miles in warmer months. Several yoga sessions. $15 Acupuncture at Milwaukee Community Acupuncture. “Energy” Massage by Jane Borden. Stretching. Sauna. Steam room. Meditation. Sufficient sleep. Large amount and variety of organic, vegan, natural, and often raw veggies with hummus, berries and other fruits, spirulina, chlorella, bee pollen, maca, coconut yogurt, kimchi, quinoa, nuts, seeds, etc. With irregular swimming, biking, weights, and a wide variety of other sports. Can you tell us about The Give Shirt? All info, including videos, is on http://www.thegiveshirt.com/. In short, we are increasing the consciousness and behavior of giving throughout the world, thereby making it a happier and healthier place. Uniquely and primarily we do this by distributing clothing printed with the word “give”. We also give ALL of the proceeds to numerous other charities, while simultaneously raising public awareness of those charities. We are 100% volunteer-operated and are only limited by the number of dedicated volunteers – so we hope you join us! When did the project begin and how has it grown over the years? 2008. The initial “huge” idea was to get hundreds of shirts (all organic cotton, unisex, black t-shirts) and give all the proceeds away. We now have more than 10,000 pieces of apparel printed with the word give, thousands of which have already been distributed. And the idea has become an international movement which has become my way of life. What is your goal for The Give Shirt? That every person in the world is as happy and healthy as possible. We believe that giving is a powerful and essential tool to accomplish this. What inspired you to start The Give Shirt? In Thailand, I experienced people freely giving everything. And they are the happiest people I’ve ever seen. I began dedicating my life to helping others also be truly happy by sharing this powerful message of giving. For Christmas, I asked everybody to please not give me any “things”. My brother gave me a shirt with the word “give” on the front. I tried to buy a couple more shirts just like it and couldn’t find one! I had to have them made. It cost less to make 12 shirts, so I was going to give some to others. Suddenly I realized … why not have thousands made so the act of giving can be promoted by even more people? The whole process can be about giving, so I won’t keep any money and give all of the proceeds to charities! Thus, the GIVE shirt movement was born. The 6th Annual Worldwide Runathon to Raise Awareness of Health is one way. People across the globe raise money for and/or donate money to any good cause of their choice, and some choose the GIVE shirt movement. Many give donations other times of the year, including when they get the GIVE shirt and other apparel. Sometimes volunteers organize other fundraising events, etc. Who benefits from The Give Shirt? Due to the ripple effect, everyone in the world, including in the coming future, benefits in some way. Everyone who consciously or subconsciously sees the word give printed on someone’s clothing benefits. Those wearing the clothing and promote the concept of giving benefit even more! Multitudes of charities that we help raise awareness of and money for benefit, especially those for whom we offer the GIVE shirt at their events. Volunteers benefit. Etc. How can people get involved or donate to The Give Shirt? Click the “Donate” button on the top right of website. Send an email to theGIVEshirt@gmail.com. See more info at the “Volunteer” tab. Trails without pollution and noise. Though I live to influence others, I also like running in traffic only for that reason. But along the lake downtown is a good mix of the two with hills and steps. I love sharing the energetic vibration of others, especially active, positive people caring about and enjoying themselves and the environment and helping others. The Badgerland Striders Milwaukee Lakefront Marathon. We are partnered with them. They sponsor a booth for us to offer the GIVE shirt at the expo and provide a race entry for me to run with everyone, while co-promoting our cause year-round on the website, build-up runs, etc. All other Badgerland Strider runs are great events with great people and super affordable entry fees because they are not a business making money, but rather a nonprofit group of volunteers and great people helping the community become healthier and happier by running! I also love the concept of any charity run/walk, 5k or otherwise. Because the point is to help others. And running/walking is the tool. They also draw a great variety of people, many of whom are looking to help and “give”! Hope to see everyone at the Runathon! Or that everyone at least registers and does something active that day, wherever they are. This entry was posted in MKE Runners and tagged MKE Runners, Running in MKE, The Give Shirt, Thomas Budde. Bookmark the permalink. ← Spartan Race Entry Giveaway Winner!